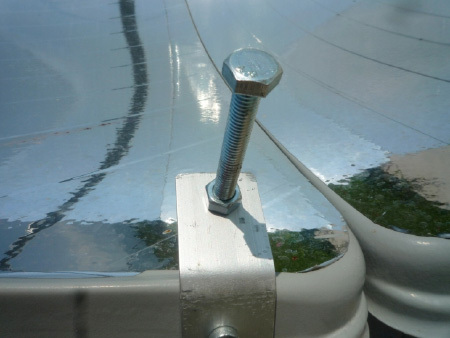 Focusing of a Solar parabolic cooker consists in targeting the reflector to the sun in such a way that the axis of the reflector is parallel to the direct sunlight. When this is fulfilled, the device is so designed, that the bright spot of the focus falls within the area of the supporting grid(supporting ring). In this sense, as synonyms are used the terms "focusing", "proper directing", "proper orientating", "proper focusing", “proper targeting”. In the so-called deep parabolic cooker, there are no constructive constrictions to the rotation of the reflector - from this type is the model SK-01 of HoSa Solar LTD. Here the steel bar that supports the cooking vessel is horizontal and passes through two opposite points of the reflector. To facilitate the focusing, a directional pin (DP) is oftenly used, which is mounted so as to be parallel to the axis of the reflector. Therefore, if DP makes no shadow, it means that the reflector is properly directed (focused)! the directional pin makes a shadow! the dirpin makes no shadow! Another visual criterion that the cooker is properly focused is the presence of a bright spot of concentrated light on the cooking vessel. This is the general criterion, valid by all SPC models. Case 1. The stand that supports the cooking vessel is vertical and passes through the geometric apex of the reflector - LD150 and LD180 models of HoSa Solar Ltd are of this type. With this type of construction two ways of focusing are available, depending on the height of the sun above the horizon: focusing at low sun and focusing at high sun. a/ The sun height above the horizon is small, so that even in the steepest possible position of the reflector its axis can not be parallel to the sun rays: the angle between the reflector-axis and the horizon is greater than the angle between the sunrays and the horizon. Operating position of the device under low sun: the reflector is steeply tilted to catch the low sun, and the pot holder is pulled back in direction to the reflector. In models LD150 and LD180 this type of focusing is mandatory when the height of the sun above the horizon is less than 40°. In this mode the unit operates early morning and late afternoon during the summer and all day during the winter. This mode of operation does not reduce the effectiveness of the parabolic cooker, because despite the lack of parallelism, the effect of concentration of the sun rays remains. With this new feature however, that the real focus is no longer coincident with the geometrical focus – displacement is observed of the focus spot and a change in its shape. A typical focus spot of the model LD180 in a low sun mode: the real focus spot has a "C" -form and is located between the reflector and the geometrical focus. Operating position of the device under high sun: The slope of the reflector is no longer so steep. The pot holder is moved forward to its normal position. The axis of the reflector is parallel to the direct sunlight. The real focus matches geometrical one. Case 2. The stand that supports the cooking vessel is independent of the reflector. This is the simplest flat type parabolic. The cooking vessel usually hangs from a vertical stand (a tripod or other similar structure) with the ability for 3D-regulating the position of the vessel. No constructive obstacles to parallelism between the reflector-axis and the sun rays. Оn the flat parabolic reflector could also a directional pin be mounted. In this case however, it should be born in mind that the presence of a DP-shade is not necessarily a sign of wrong focusing! At sun height of below 40°, DP of a LD150 cooker for example will inevitably cast a shade, but this might simply be a sign of low sun functioning, not of а wrong focusing. In general, focusing requires the reflector to be rotated in two planes, every 30-40 minutes. In practice, however, for a certain time interval around noon point, it is enough the rotation to be performed only in a horizontal plane, in order the focal spot to remain within the reach of the cooking vessel! This is due to the fact that during that period the sun changes only a little its height. For example, for 42°N, in summer months, between 11:00 h and 15:00 h, it is sufficient the reflector to be rotated only horizontally!